(CNN) Kevin Kisner held a slender one-shot lead over fellow American Chris Stroud and Japan’s Hideki Matsuyama as Quail Hollow’s infamous “Green Mile” finishing holes took their toll in Saturday’s third round of the PGA Championship. The 33-year-old Kisner showed a sublime touch on the final green to escape with only a bogey five for a one-over 72 and seven-under 206 as he bids for his first major title. Matsuyama, hoping to make golfing history as Japan’s first major winner, had a birdie putt to tie him, but it came up just short. Stroud, playing in the group ahead, had to complete five holes of his second round earlier Saturday before mounting a strong challenge with a level-par 71 in North Carolina, spoiled by two closing bogeys. Kisner, who has led every round of the final major of the season, got to 10-under with successive birdies on the 14th and 15th, but found the water at the next for a double bogey, his putt for a five bouncing out of the cup in identical fashion to Stroud’s. 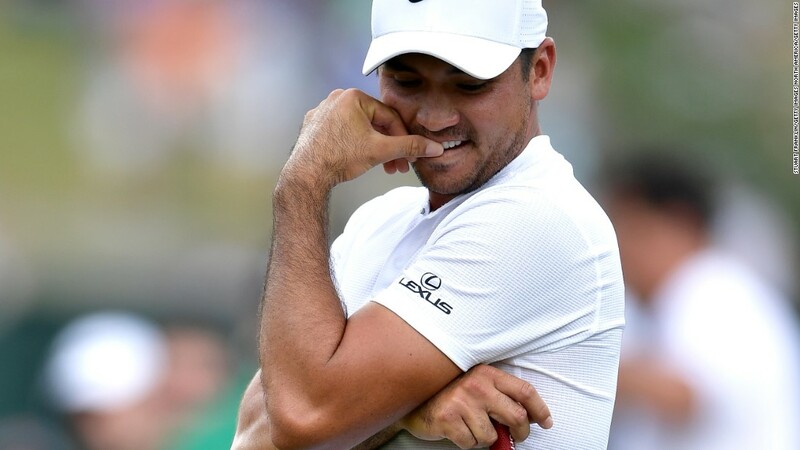 But the main victim of Quail Hollow’s final three holes, named after the 1999 film starring Tom Hanks, was Australia’s former PGA champion Jason Day. He looked set to mount a serious challenge before bogeying the 17th then running up a sorry quadruple bogey on the last after finding trouble off the tee. It took him back to level par, seven shots adrift of the lead. Rickie Fowler was another, dropping four shots over the stretch to derail his challenge and go back to one-under-par. But fellow American young gun Justin Thomas avoided the carnage and is well placed on five-under after a 69, the same mark as South African Louis Oosthuizen. Earlier, Jordan Spieth’s hopes of a career grand slam evaporated after a level-par 71, wrecked by a closing double bogey to stand three-over overall. “I feel like my game truly suits the other three majors maybe more than a PGA,” Spieth admitted. Rory McIlroy, 10 shots back overnight, also went backwards in another disappointing display in the majors this season, carding a two-over 73 for four-over, the same mark as world number one Dustin Johnson.